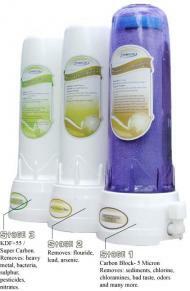 This configuration of the C-3 pre-filter is designed for municipalities that have fluoride in their drinking water. Each of the 3 filter catridges in the C3 pre-filter is devoted to addressing a different set of harmful contaminants that are present in varying levels in your source water. Removes sediments, chlorine, THMs (a carcinogenic by-product of chlorination), bad taste, odors, and more. 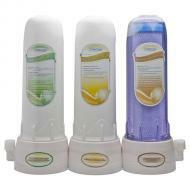 Removes fluoride as well as lead and arsenic that can be present in trace levels in your water source.